Roya Giordano of Leesburg, and co-founder of advocacy group Team Mathias, is asking Donald Trump and staff to consider illuminating the White House for September's Childhood Cancer Awareness Month. WASHINGTON— A local mother has a request for President Donald Trump: She wants the White House to change colors next month. “I’m asking for the White House to go gold,” said Roya Giordano, of Leesburg, Virginia. September is Childhood Cancer Awareness Month, and Giordano wants to honor the many children who are diagnosed or pass away each year from pediatric cancers. The petition comes after a family member died due to bone cancer nearly four years ago. Her son, Mathias, was diagnosed with the bone cancer osteosarcoma when he was 11. He fought the cancer that started in his leg for 29 months, but died in December 2014 at age 13. Since then, Roya and her husband Chris founded Team Mathias. The organization raises awareness about pediatric cancers and supports other families whose children are grappling with various forms of the disease. Family support activities include giving passes to D.C. United soccer games so families can “forget about the cancer world, even for two hours,” Roya told WTOP in July, outside the newly-opened Audi Field. 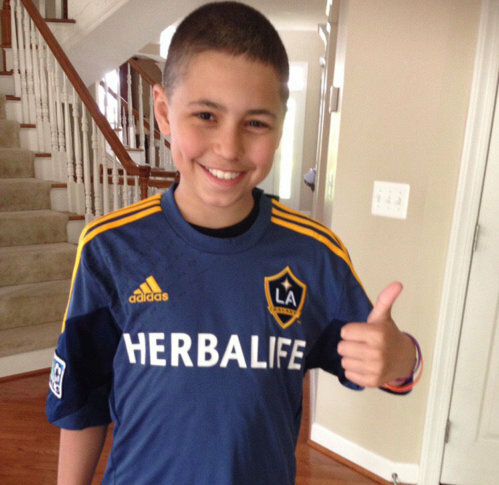 It’s another way to keep Mathias’ memory alive, because he was an athlete who loved playing and watching soccer games. Tickets also go to families that are grieving after the death of a loved one, said Chris following the team’s inaugural game at Audi Field. So far, the petition has gathered more than 128,000 signatures. Giordano would like the White House to consider illuminating the building gold during CureFest, an event held on the National Mall during Childhood Cancer Awareness Month. “It would be amazing if the White House would go gold on either for the 15th or 16th for these families to see that our president supports us and supports this cause,” Giordano said. She plans to keep asking until the White House is lit up in gold.